Preheat oven to 400°F. Put squash on a roasting pan and toss with 2 tablespoons olive oil, maple syrup, salt and pepper. Roast for 15 minutes. Turn and roast 15 minutes more or until tender. Remove from oven and cool. Bring cider or juice and vinegar to a boil in a small saucepan over medium high heat and cook for 10 minutes, reducing to 1/4 cup. Remove from heat and whisk in the mustard, 1/4 cup olive oil, salt and pepper to taste. Place arugula and squash in a bowl and spoon enough dressing over to moisten, and then toss well. Plate on a large platter. 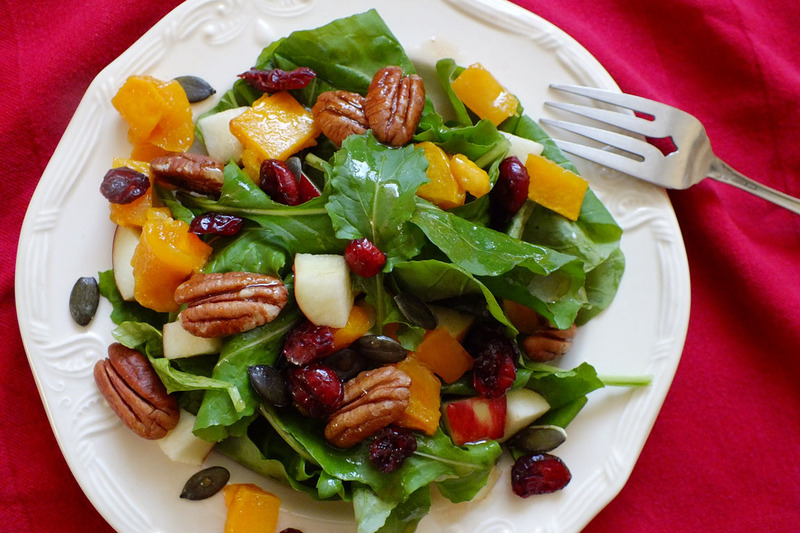 Scatter the apples, pecans, pumpkin seeds and dried cranberries on top and serve immediately.